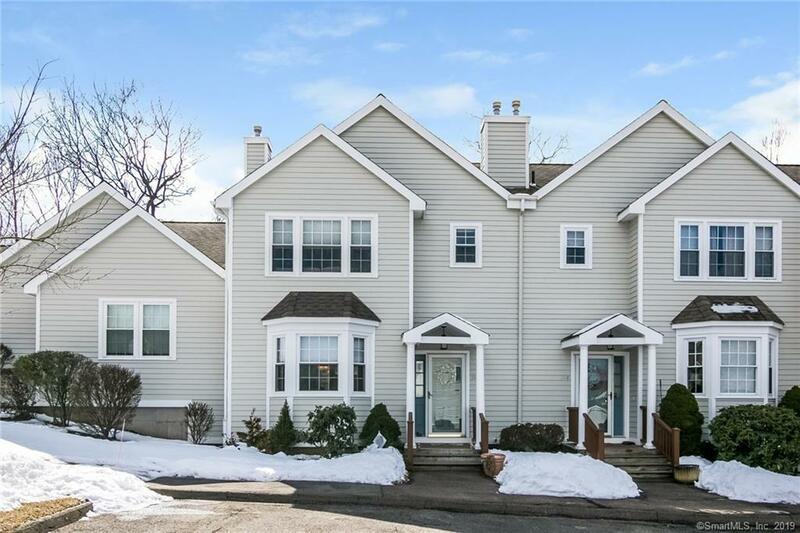 Warm and welcoming townhouse style home in the sought-after Ridges at Pond Hill has many features you are sure to appreciate. A tiled foyer entry and kitchen area lend themselves for easy care and a homey feel. This eat-in kitchen has newer stainless steel appliances (with an extended warranty until 2023) and granite counter tops. The combination living room and dining room are flooded with light from the over sized windows and atrium door. During the warmer seasons, you will enjoy the expanded patio. The outdoor area when in full bloom, creates a courtyard feel where you feel nestled in your own private sanctuary. Moving to the upstairs level, you will find the laundry conveniently located with the two bedrooms. Each bedroom has its own full bath. The spacious square footage, cathedral ceilings and a beautiful Palladian window in the master bedroom suite make this space a true escape! The second bedroom is currently being utilized as a home office / den. You will enjoy the easy lifestyle of condominium living as well as economical natural gas heat and the benefit of Wallingford Electric, and all that Wallingford has to offer!